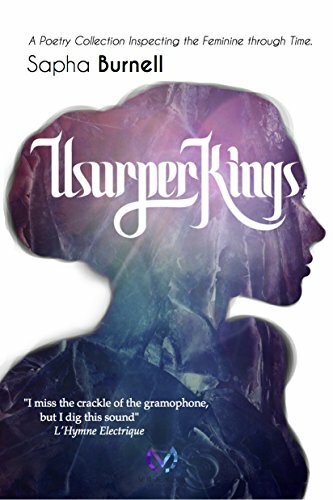 Usurper Kings is Sapha Burnell's poetry collection in five acts. Without each poem's strength and individual beauty at that exact place, the entire structure would fold in on itself. Move a piece, and the laws governing the works are turned on their heads. Usurper Kings is an inspection of the feminine through time. Sapha Burnell's large scale debut on the surface, is a poetry collection in five Acts. However, without each poem's strength and individual beauty at that exact placement, the entire structure would fold in on itself. Move a piece, and the laws governing the works are turned on their heads. Without each work proclaiming its necessity, obstinate in its existence, Usurper Kings would serve no purpose, and become a litany of words rather than a treatise on cosmology and feminism throughout time and beyond our scope. In the middle of recording for its' audiobook, Usurper Kings will finally be available as intended: A performance piece and the written word. Act I: Generosus "Bang! You're it!" Act II: Eve and the Other "Can't make peace with a warlord taken on the dance floor"
Act III: Time Masters & the Cogs "I miss the crackle of the gramophone, but I dig this sound"
Act IV: Chaos Machines "Uncle Bob? Is that you, 400 million years ago?" Act V: The Universe Child "Is it god?" they asked. "Are they god?" it asked.